Kham Duc Special Forces Camp (A-105), was located on the western fringes of Quang Tin Province, South Vietnam. In the spring of 1968, it was the only remaining border camp in Military Region I. Backup responsibility for the camp fell on the 23rd Infantry Division (Americal), based at Chu Lai on the far side of the province. The camp had originally been built for President Diem, who enjoyed hunting in the area. The 1st Special Forces Detachment (A-727B) arrived in September 1963 and found the outpost to be an ideal border surveillance site with an existing airfield. The camp was located on a narrow grassy plain surrounded by rugged, virtually uninhabited jungle. The only village in the area, located across the airstrip, was occupied by post dependents, camp followers, and merchants. 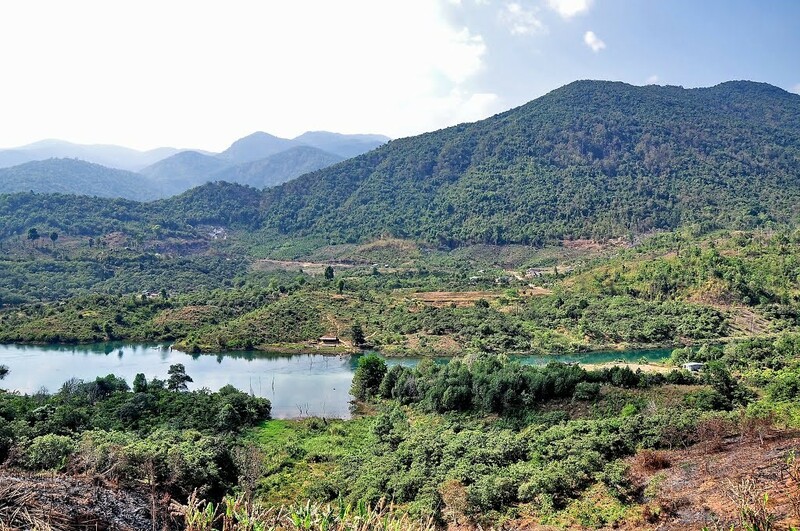 The camp and airstrip were bordered by the Ngok Peng Bum ridge to the west and Ngok Pe Xar mountain, looming over Kham Duc to the east. Steeply banked streams full of rapids and waterfalls cut through the tropical wilderness. The Dak Mi River flowed past the camp over a mile distant, under the shadow of the Ngok Pe Xar. Five miles downriver was the small forward operating base of Ngok Tavak, defended by the 113-man 11th Mobile Strike Force Company with its eight Special Forces and three Australian advisors. Since Ngok Tavak was outside friendly artillery range, 33 Marine artillerymen of Battery D, 2nd Battalion, 13th Marines, with two 105mm howitzers were located at the outpost. Capt. Christopher J. Silva, commander of Detachment A-105 helicoptered into Ngok Tavak on May 9, 1968, in response to growing signs of NVA presence in the area. Foul weather prevented his scheduled evening departure. A Kham Duc Civilian Irregular Defense (CIDG) platoon fleeing a local ambush also arrived and was posted to the outer perimeter. It was later learned that the CIDG force contained VC infiltrators. At 3:15 am on May 10, 1968, Ngok Tavak was attacked by an NVA infantry battalion. First, the base was pounded by mortars and direct rocket fire followed by a frontal assault. VC infiltrators dressed as Kham Duc CIDG soldiers moved toward the Marines in the fort yelling, “Don’t shoot, don’t shoot! Friendly, friendly” before lobbing grenades into the Marine howitzer positions and ran into the fort, where they shot several Marines with carbines and sliced claymore mine and communication wires. The defenders suffered heavy casualties but stopped the main assault and killed the infiltrators. The NVA dug in along the hill slopes and grenade filled trenches where the Mobile Strike Force Soldiers were pinned by machine gun and rocket fire. An NVA flame-thrower set the ammunition ablaze, banishing the murky flare-lighted darkness for the rest of the night. Sgt. 1st Class Harold M. Swicegood and the USMC platoon leader, Lt. Adams, were badly wounded and moved to the command bunker. Medic Spec 4 Blomgren reported that the CIDG mortar crews had abandoned their weapons. Silva tried to operate the main 4.2-inch mortar but was wounded. At about 5 am hours, Sgt. Glenn Miller, an A-105 communications specialist, was shot through the head as he ran over to join the Marine howitzer crews. The NVA advanced across the eastern side of Ngok Tavak and brought forward more automatic weapons and rocket-propelled grenade launchers. In desperation, the defenders called on US Air Force AC-47 “Spooky” gunships to strafe the perimeter and the howitzers, despite the possible presence of friendly wounded in the gun pits. The NVA countered with tear gas, but the wind kept drifting the gas over their own lines. After three attempts, they stopped. A grenade fight between the two forces lasted until dawn. At daybreak Australian Warrant Officers Cameron and Lucas, joined by Blomgren, led a CIDG counterattack. 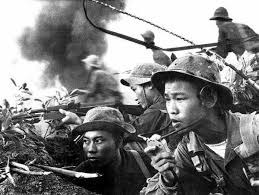 The North Vietnamese pulled back under covering fire, and the howitzers were retaken. The Marines fired the last nine shells and spiked the tubes. 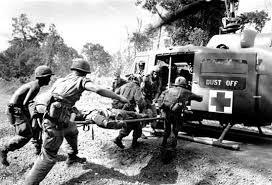 Later that morning medical evacuation helicopters supported by covering airstrikes took out the seriously wounded, including Silva and Swicegood. Two CH46’s were able to land 45 replacements from the 12th Mobile Strike Force Company, accompanied by Capt. Euge E. Makowski, but one helicopter was hit in the fuel line and forced down. Another helicopter was hit by a rocket and burst into flames, wrecking the small helipad. The remaining wounded were placed aboard a hovering helicopter. As it lifted off, two Mike Force soldiers and 1st Lt. Horace Fleming, one of the stranded aviation crewmen, grabbed the helicopter skids. All three fell to their deaths after the helicopter had reached an altitude of over one hundred feet. The mobile strike force soldiers were exhausted and nervous. Ammunition and water were nearly exhausted, and Ngok Tavak was still being pounded by sporadic mortar fire. They asked permission to evacuate their positions, but were told to “hold on” as “reinforcements were on the way.” By noon the defenders decided that aerial reinforcement or evacuation was increasingly unlikely, and night would bring certain destruction. An hour later, they abandoned Ngok Tavak. Sgt. Thomas Perry, a medic from C Company, arrived at the camp at 5:30 am the morning of the 10th. He cared for the wounded and was assisting to establish a defensive perimeter when the decision was made to evacuate the camp. As survivors were leaving, Perry was seen by Sgt. Cordell J. Matheney, Jr., standing 20 feet away, as Australian Army Capt. John White formed the withdrawal column at the outer perimeter wire on the eastern Ngok Tavak hillside. It was believed that Perry was going to join the end of the column. All the weapons, equipment and munitions that could not be carried were hastily piled into the command bunker and set afire. The helicopter that had been grounded by a ruptured fuel line was destroyed with a LAW. Sgt. Miller’s body was abandoned. After survivors had gone about 1 kilometer, it was discovered that Perry was missing. Efforts were conducted to locate both Perry and Miller, including a search by a group from Marine Battery D. They were searching along the perimeter when they were hit by enemy grenades and arms fire. Neither the men on the team nor Perry was ever found. Included in this team were Pfc. Thomas Blackman; LCpl. Joseph Cook; Pfc. Paul Czerwonka; LCpl. Thomas Fritsch; Pfc. Barry Hempel; LCpl. Raymond Heyne; Cpl. Gerald King; Pfc. Robert Lopez; Pfc. William McGonigle; LCpl. Donald Mitchell; and LCpl. James Sargent. 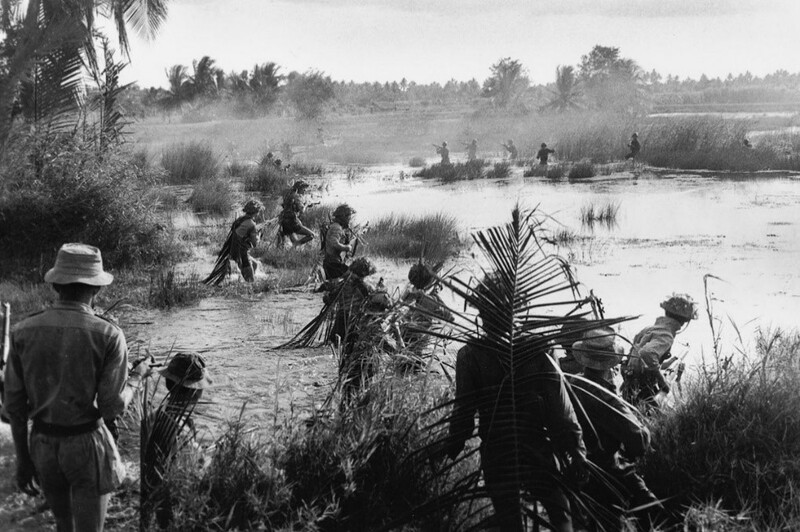 The remaining survivors evaded through dense jungle to a helicopter pickup point midway to Kham Duc. Their extraction was completed shortly before 7 pm on the evening of May 10. In concert with the Ngok Tavak assault, the Kham Duc was blasted by a heavy mortar and recoilless rifle attack at 2:45 that same morning. 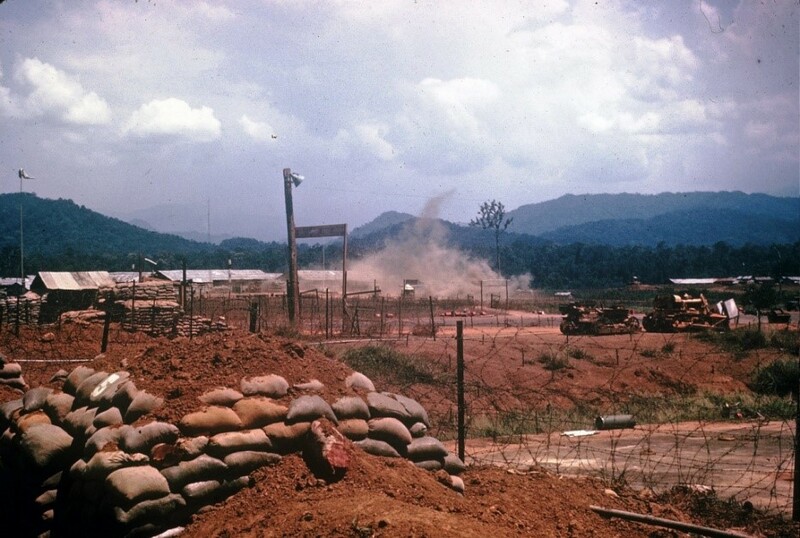 Periodic mortar barrages ripped into Kham Duc throughout the rest of the day, while the Americal Division airmobiled a reinforced battalion of the 196th Infantry Brigade into the compound. A Special Forces command party also landed, but the situation deteriorated too rapidly for their presence to have a positive effect. The mortar attack on fog-shrouded Kham Duc resumed on the morning of May 11. The bombardment caused heavy losses among the frightened CIDG soldiers, who fled from their trenches across open ground, seeking shelter in the bunkers. The Army of the Republic of Vietnam Special Forces (LLDB) commander remained hidden. CIDG soldiers refused orders to check the rear of the camp for possible North Vietnamese intruders. That evening the 11th and 12th Mobile Strike Force companies were airlifted to Da Nang, and half of the 137th CIDG Company from Camp Ha Thanh was air landed in exchange. The 1st VC Regiment, 2nd NVA Division, began closing the ring around Kham Duc during the early morning darkness of May 12. Between 4:15 and 4:30 am, the camp and outlying positions came under heavy enemy attack. Outpost 7 was assaulted and fell within a few minutes. Outposts 5, 1 and 3 had been reinforced by Americal troops but were in North Vietnamese hands by 9:30 am. OP1 was manned by Pfc. Harry Coen, Pfc. Andrew Craven, Sgt. Joseph Simpson, and Spec 4 Julius Long from Company E, 2nd of the 1st Infantry. At about 4;15 am, when OP1 came under heavy enemy attack, Pfc. Coen and Spec 4 Long were seen trying to man a 106-millimeter recoilless rifle. 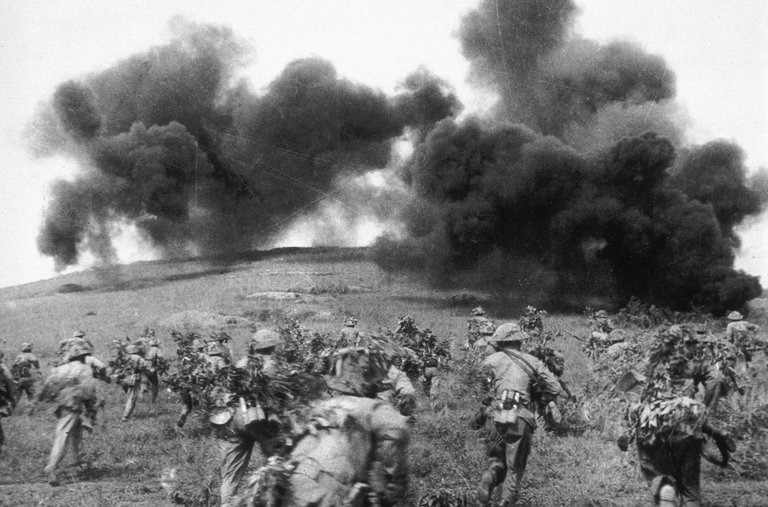 Survivors reported that in the initial enemy fire, they were knocked off their bunker. Both men again tried to man the gun but were knocked down again by RPG-7 Rocket Launcher fire. Pfc. Craven, along with two other men, departed the OP1 at 8:30 am on May 12. They moved out 50 yards and could hear the enemy in their last position. At about 11 AM hours, as they were withdrawing to the battalion perimeter, they encountered an enemy position. Craven was the point man and opened fire. The enemy returned fire, and Craven fell with multiple chest wounds. The other two men were unable to recover him and hastily departed the area. Craven was last seen lying on his back, wounded, near the camp. OP2 was being manned by 1st Lt. Frederick Ransbottom, Spec 4 Maurice Moore, Pfc. Roy Williams, Pfc. Danny Widmer, Pfc. William Skivington, Pfc. Imlay Widdison, and Spec 5 John Stuller, from the 2nd of the 3rd Infantry, when it came under attack. Informal questioning of survivors of this position indicated that Pfc. Widdison and Spec 5 Stuller may have been killed in action. However, the questioning was not sufficiently thorough to produce enough evidence to confirm their deaths. The only information available concerning 1st Lt. Ransbottom, Spec 4 Moore, Pfc. Lloyd and Pfc. Skivington that Lt. Ransbottom allegedly radioed Pfc. Winder and Pfc. Williams, who were in the third bunker, and told them that he was shooting at the enemy as they entered his bunker. Spec 4 Juan Jimenez, a rifleman assigned to Company A, 2nd of the 1st Infantry, was occupying a defensive position when he was severely wounded in the back by enemy mortar fire. He was declared dead by the Battalion Surgeon in the early morning hours of May 12. He was then carried to the helipad for evacuation. However, due to the situation, space was available in the helicopter for only the wounded, and Jimenez’ remains were left behind. 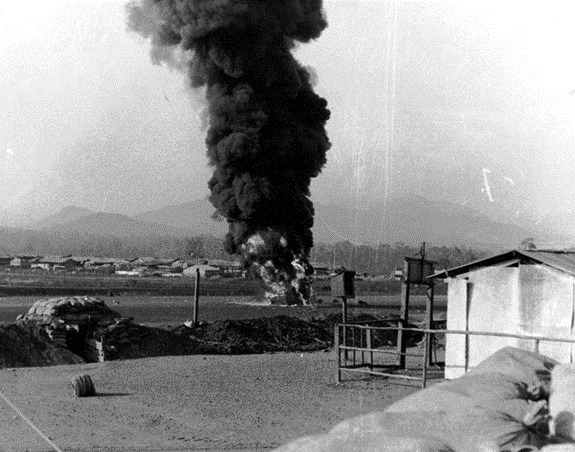 At noon, a massive NVA attack was launched against the main compound. The charge was stopped by planes hurling napalm, cluster bomb units, and 750-pound bombs into the final wire barriers. The decision was made by the Americal Division officers to call for immediate extraction. The evacuation was disorderly, and at times, on the verge of complete panic. 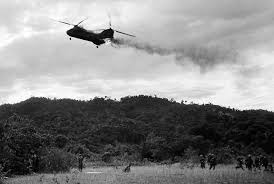 One of the first extraction helicopters to land was exploded by enemy fire, blocking the airstrip. Engineers of Company A, 70th Engineer Battalion, frantically reassembled one of their dozers (previously torn apart to prevent capture) to clear the runway. 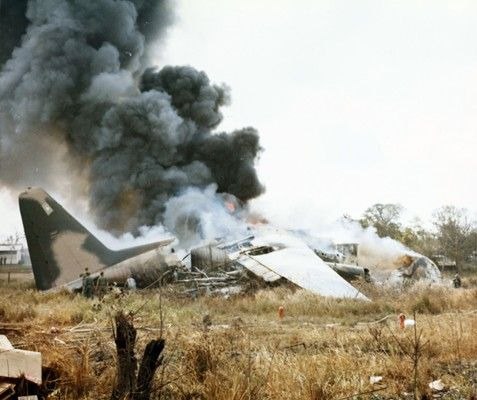 Eight more aircraft were blown out of the sky. When Pfc. Richard E. Sands, a member of Company A, 1st Battalion, 46th Infantry, 198th Light Infantry Brigade, was being extracted on a CH47 helicopter, it was hit by 50 caliber machine gun fire at an altitude of 1500-1600 feet shortly after takeoff. Sands, who was sitting near the door gunner, was hit in the head by an incoming round. The helicopter made a controlled landing and caught fire. During the evacuation from the burning helicopter, f our personnel and a medic checked Sands and indicated that he had been killed instantly. Because of the danger of incoming mortar rounds and the fire, personnel attempting to remove Sands from the helicopter were ordered to abandon their attempt. The remaining personnel were evacuated from the area later by another helicopter. Intense antiaircraft fire from the captured outposts caused grave problems. Control over the indigenous forces was difficult. One group of CIDG soldiers had to be held in trenches at gunpoint to prevent them from blocking the runway. As the evacuation was in progress, members of Company A, 1/46, who insisted on boarding the aircraft first, shoved Vietnamese dependents out of the way. As more Americal infantry tried to clamber into the outbound planes, the outraged Special Forces staff convinced the Air Force to start loading civilians on board a C130, then watched as the civilians pushed children and weaker adults aside. The crew aboard the U.S. Air Force C130 aircraft were Maj. Bernard Bucher, pilot; Staff Sgt. Frank Hepler, flight engineer; Maj. John McElroy, navigator; 1Lt. Steven Moreland, co-pilot; George Long, load master; Special Forces Capt. Warren Orr and an undetermined number of Vietnamese civilians. The aircraft reported receiving ground fire on takeoff. The Forward Air Control (FAC) in the area reported that the aircraft exploded in mid-air and crashed in a fire ball about one mile from camp. All crew and passengers were believed dead, as the plane burned quickly and was destroyed except for the tail boom. No remains were recovered from the aircraft. Capt. Orr was not positively identified by U.S. personnel as being aboard the aircraft. He was last seen near the aircraft helping the civilians to board. However, a Vietnamese stated that he had seen Orr board the aircraft and later positively identified him from a photograph. Rescue efforts were impossible because of the hostile threat in the area. At the time, the order was given to escape and evade, Spec 4 Julius Long was with Coen and Simpson. All three had been wounded and were trying to make their way back to the airfield about 350 yards away. As they reached the airfield, they saw the last C130 departing. Coen, who was shot in the stomach, panicked and started running and shooting his weapon at random. Long tried to catch him, but could not, and did not see Coen again. Long then carried Sgt. Simpson to a nearby hill, where they spent the night. During the night, the airfield was strafed and bombed by U.S. aircraft. Long was hit twice in the back by fragments, and Simpson died during the night. Long left him lying on the hill near the Cam Duc airfield and started his escape and evasion toward Chu Lai, South Vietnam. Long was captured and was released in 1973 from North Vietnam. The Special Forces Command Group was the last organized group out of the camp. As their helicopter soared into the clouds, Kham Duc was abandoned to advancing NVA infantry at 4:33 p.m. on May 12, 1968. The last Special Forces camp on the northwestern frontier of South Vietnam had been destroyed. Two search and recovery operations were conducted near OP1 and OP2 and the Cam Duc airfield on July 18, 1970, and August 17, 1970. In these operations, remains of personnel previously reported missing from this incident were recovered and subsequently identified. They were Spec 5 Bowers, Pfc. Lloyd, Sgt. Sisk, Pfc. Guzman-Rios and Staff Sgt. Carter. Sadly, extensive search and excavation could not be completed at OP1 and OP2 because of the tactical situation. It was assumed that all the missing at Kham Duc were killed in action until about 1983 when the father of one of the men missing discovered a Marine Corps document which indicated that four of the men had been taken, prisoner. The document listed the four by name. Until then, the families had not been advised of the possibility there were any American prisoners taken other than Julius Long. A Vietnamese rallied identified the photograph of Roy C. Williams as positively having been a POW. Until proof is obtained that the rest of the men lost at Ngok Tavak and Kham Duc are dead, their families will always wonder if they are among those said to still be alive in Southeast Asia. Editor’s Note: Capt. Warren Orr was from C-Team Headquarters in Da Nang and was sent to Kham Duc to assist in the evacuation of civilians. At the time, I was the XO of A-Team 102 and was at the C-Team to conduct some personal business when I ran into Orr as he was preparing to leave for Kam Duc. He was his usual friendly, high spirited self but I sensed some apprehension and fear, which is natural when you know are going to a place where heavy fighting and dying. Had I been in his shoes, I would have felt the same. When I learned later that he died on a plane loaded with Vietnamese civilians, I felt terrible about his loss. About half the pix are not at Kham Duc,,, A Co 1/46th did not, I say NOT I SAY AGAIN ! did not pull civilians OFF any aircraft…. Upcoming book will explain this error.. I think Bill S. your right, my name is John H. Thomas (SSG) I was 1st sect Gun Chief for one of the two 105 Howitzers from A Btry. 3rd /82nd artillery flown into Kham Duc on 11 May 1968. Much of what I’m hearing about that place is true and some not. However I can only account for what I personally experienced the two days I was there. You don’t hear anything about the support from A Btry. 3rd /82nd artillery who fired continuous direct fire in support for the Infantry on a mountain top. Including counter Mortar fire.